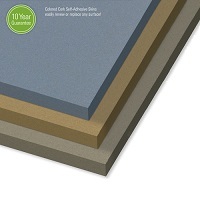 Unframed Bulletin Board Material comes in custom sized cork panels. Tackboard sheet material for refinishing old bulletin boards is easy-to-use and store. Fabric covered cork panels and colored cork rolls or colored cork sheets add a splash of color to your sound absorbing cork boards. Use unframed corkboards anywhere and enjoy the long lasting nature of self-sealing cork material!